Anyone needing to prep for an upcoming ACT Test is welcome to join us THIS Saturday for a practice round! The practice test at Main/Bon Air will start at 9:30/10AM, but participants are encouraged to arrive fifteen minutes early to get signed in, and people who arrive after the start time will not be able to make up the time they missed. Bring two #2 pencils, an ID, a calculator, and a small snack to enjoy during the fifteen minute break. 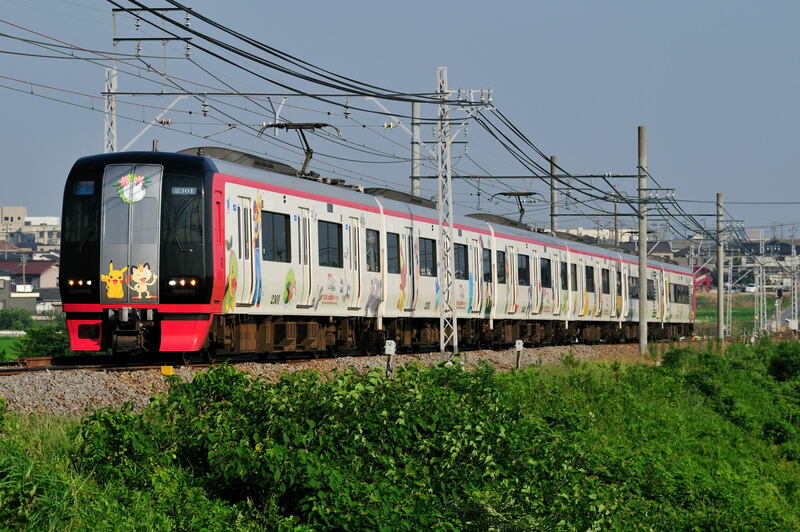 The test will last four hours, until about 1:30/2:00. If you are interested, PLEASE CALL THE LOCATION TO SIGN UP. Bon Air’s phone number is (502)574-1795 and Main’s phone number is (502)574-1724. If you feel like you need to do some ACT prep, but don’t want to do a Practice Test right now, Newburg will be hosting an ACT Basics class on Saturday from 10 to 11:30, which will include what will be covered on the test, strategies for studying, and how to approach test day. Please call 502-479-6160 to register for that. If you want to take part in some ACT prep but are unavailable THIS Saturday, Fairdale and Middletown will be hosting more ACT Practice Tests on Saturday, January 26th, and you can just call those branches to sign up! Middletown will also be hosting an ACT Basics class on Monday, January 14th from 6 – 8pm! This entry was posted in Library Programs and tagged Bon Air on January 9, 2019 by valerie. Teen Summer Reading has begun! The program is free. To register, click here or stop by any Louisville Free Public Library location. This entry was posted in Announcements, Library Programs, Summer Reading on June 1, 2018 by mk. What in the world is a morP? morP is an alternative to prom (or prom spelled backwards). Join teens around Louisville as we kick off Teen Summer Reading with lots of music, food and fun! 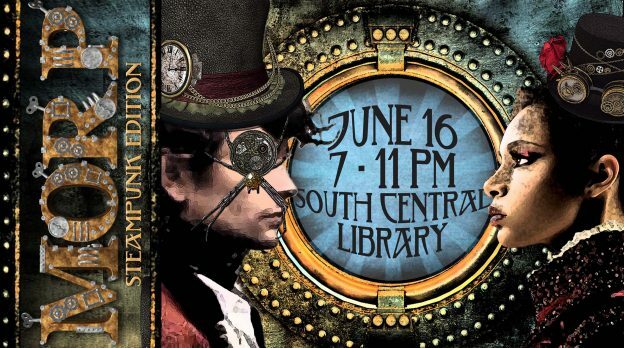 Pull out your best steampunk gear and come dance with us as DJ L. Churchill spins on the 1’s and 2’s. For more information, please call (502) 964-3515. Grades 7-12. Registration is required. Click here to sign up. Not sure what to wear to morp? Come to one one of our steampunk accessory programs! 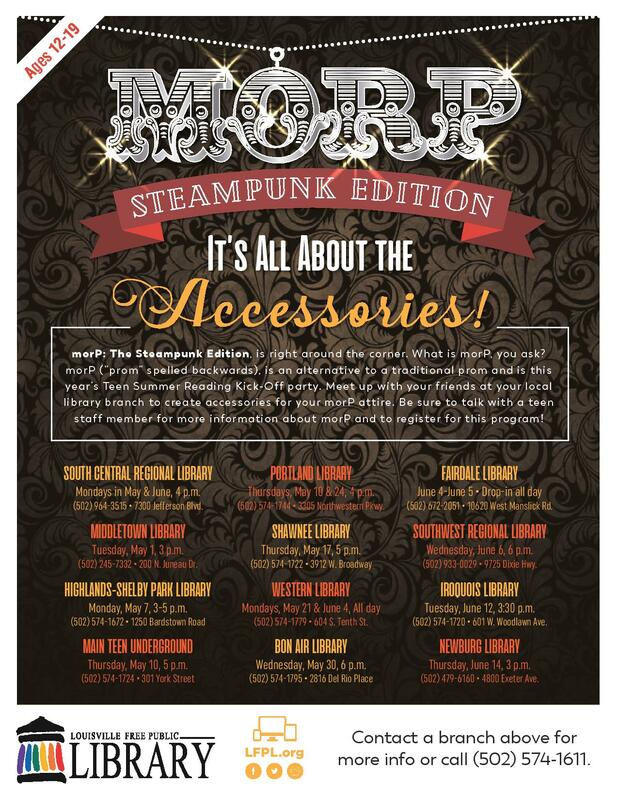 This entry was posted in Announcements, Library Programs and tagged accessories, morP, steampunk on May 25, 2018 by mk. Main Library, Thursday, March 15, 6:30 p.m.
From bestselling and award-winning author and illustrator Peter Brown comes The Wild Robot Escapes—a heartwarming and action-packed sequel to The Wild Robot, his New York Times bestseller for middle schoolers about what happens when nature and technology collide. Brown is the 2013 Caldecott Honor-winning illustrator of Creepy Carrots! and his other children’s books—including The Curious Garden, Children Make Terrible Pets, and Mr. Tiger Goes Wild—are all New York Times bestsellers. Join Peter Brown for a fun, interactive discussion of his work and his latest book,at the Main Library. This program is free, but tickets are required; click here to order. This entry was posted in Announcements, Library Programs and tagged Carmichael's Kids, Peter Brown, The Wild Robot Escapes on March 1, 2018 by mk. 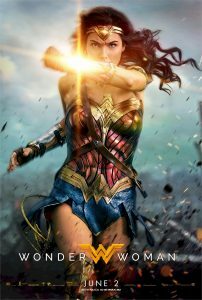 Wonder Woman Movie Viewing TOMORROW!! Join us at Bon Air Library for some free snacks and a cool movie! 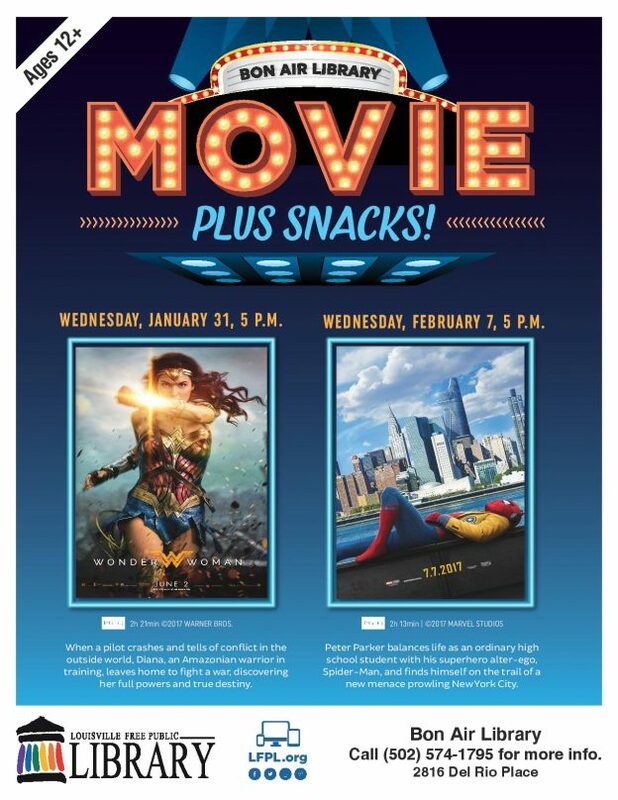 This Wednesday at 5pm, we’ll be watching Wonder Woman, and next Wednesday at 5pm we’ll be watching Spider-Man: Homecoming! This entry was posted in Library Programs, TV & Movies and tagged Bon Air, free food, Spider-Man, Wonder Woman on January 30, 2018 by valerie. Just a friendly reminder, anime fans! 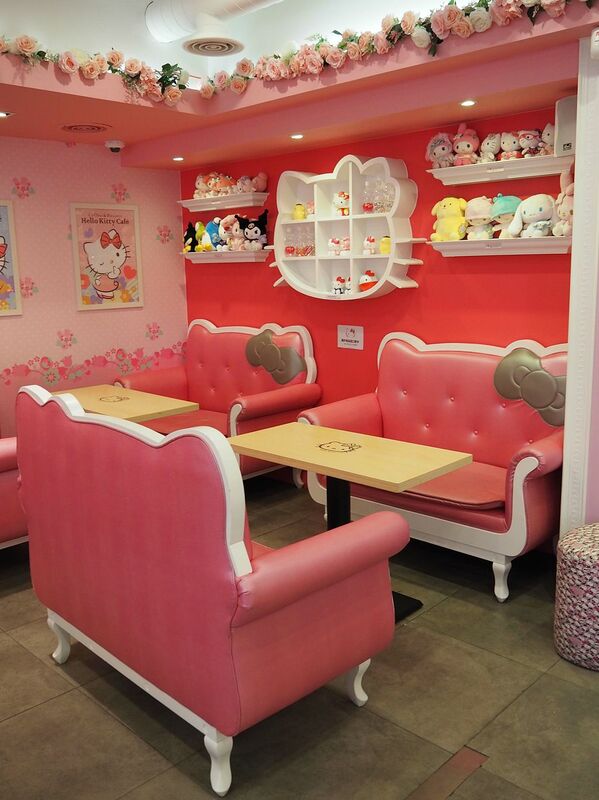 Fandom Obsession Level: Hello Kitty Café. The Louisville Free Public Library system has a few regular anime clubs! Come prepared to talk, snack, and watch your shows. This entry was posted in Library Programs and tagged anime, fan fiction, graphic novels, library events, manga on July 13, 2017 by Katherine. 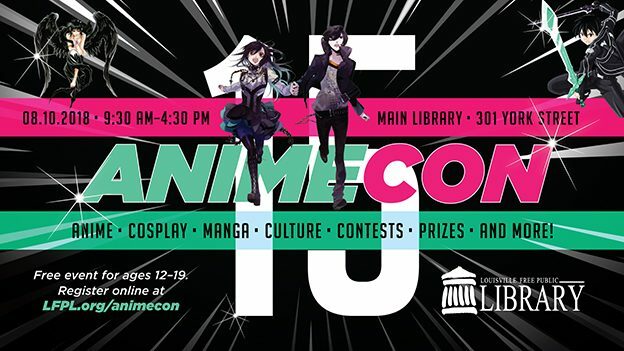 The 11th annual AnimeCon – a day-long celebration of anime and Asian culture – returns to the Main Library, Friday, August 1. The convention is free and open to teens 12-19. For a complete schedule of activities and anime screenings, click here. Register here if you haven’t already. This entry was posted in Library Programs on July 29, 2014 by mikeward. 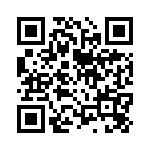 If you’re reading this post on the LFPL Teen Blog, you’re probably here because of the Teen After Hours Party QR Code Scavenger Hunt. Congrats on making it past stage one! Simply click the link below to move on to the next clue. 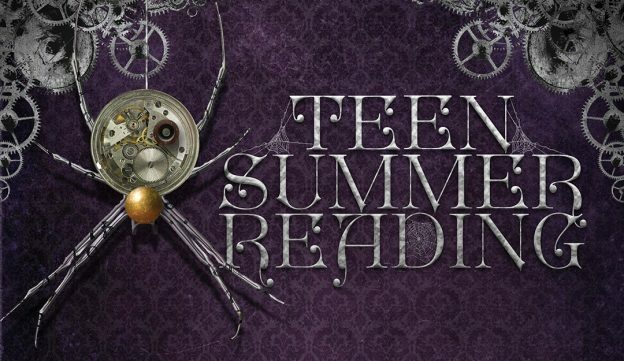 You may be interested to know that leaving a comment on our Teen Blog counts as one of the participation points for Teen Summer Reading program. Feel free to check out the back log of blog posts and follow us as we publish articles each week. This entry was posted in Library Programs, Summer Reading on July 11, 2014 by mikeward.